At first, the problem seemed pretty simple. The rear sprocket had skewed and was causing the rear sprocket to be misaligned with the chain guide every half rev. This caused the chain to ride up on the sprocket, dramatically increase tension, and casing the whole thing to bind. Simple enough, just selectivly tighten the nine bolts connecting the sprocket to the spokes to correct the skew. Right? First off, the sprocket bolts are an absolute pain to access when they’re on the bike. After struggling with that longer than I’d care to admit, I got the skew where the chain wasn’t binding. This led to the discovery of problem B: the sprocket was no longer centered. Crap. So after spending even more time struggling to loosen the bolts I had just tightened, I grabbed some scrap wood and attempted to realign the sprocket using a dead-blow. Resigned to my fate, I finally decided to remove the rear wheel, which, in hindsight, I should have done in the first place. The de-centering was more worrying. Even more so was how tight the bolts were, how easy we were taking it on the engine, and how few miles it took for it to all go so wrong. Clearly some googling was in order. With very little googling, I discovered there is a solution to this problem. 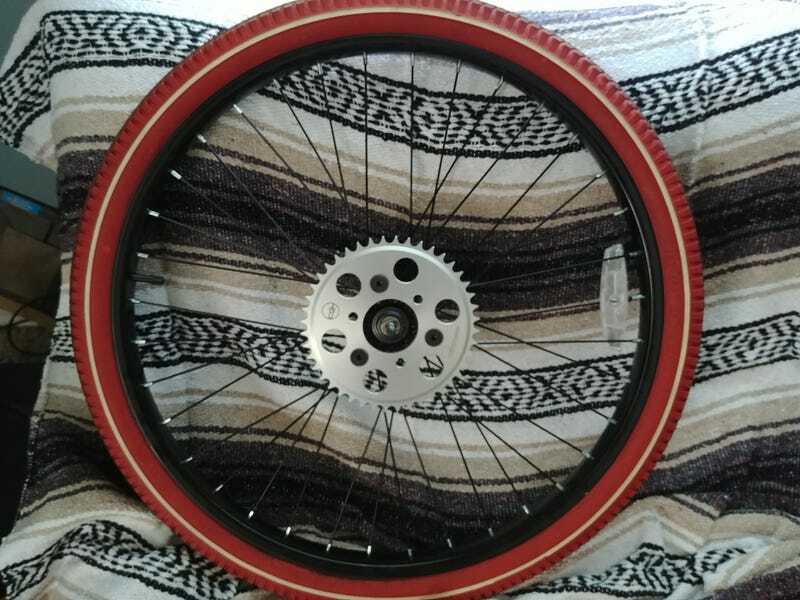 Pay money more money than you are strictly comfortable with to change the sprocket mounting from the spokes to the hub. On the surface, this is an excellent idea. The hub is the center of the wheel and therefore is... centered. Further, you’re no longer putting clamping stress or rotational stress on your spokes, which means you’re not going to destroy them as quickly. The only downside I could see is the thing costs $70. Goodbye budget! I hardly knew ye. The part seemed pretty well made and install was simple. The only thing that had me worried is the screws didn’t have much resistance screwing in. To allay any fears of those backing out, our good friend blue loctite was employed. Overall I’m happy with the upgrade. The downside is it does introduce another adjustment as the hub clamp can be moved in and out, but this also solves my problem of the chain periodically rubbing on the frame. Test drive presented no problems outside of the need for further adjustment, so overall I am pleased. Not terribly happy I felt the need to replace a major component so early in the process, but here we are.